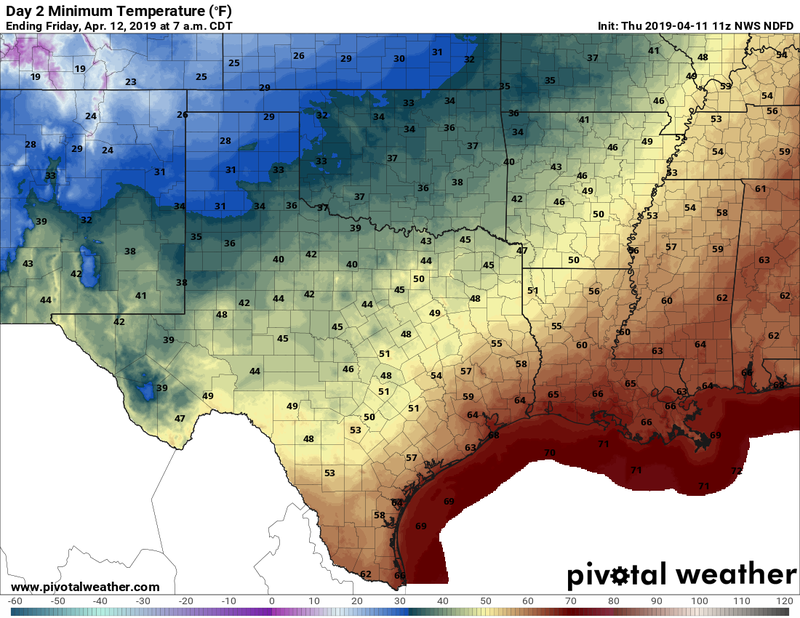 After two almost summer-like days, Houston’s temperature will now take a bit if a step back toward spring. Looking ahead to the weekend, Saturday still looks messy, but Sunday sure should be fine. Plan your activities accordingly. Temperatures are quite warm this morning, with lows only getting down to around 70 degrees for much of the region. Partly cloudy skies and the approach of a weak cold front will help to moderate temperatures today, likely keeping them in the low- to mid-80s. The front should stall somewhere between downtown and the coast this afternoon, and could serve briefly as a focus for scattered, light showers south and east of Highway 59. Lows tonight will get into the 50s for areas well inland tonight, and 60s closer to the coast. A partly sunny day, with highs likely in the low- to mid-80s. Any remnant of the front will be blown away by the onshore flow later in the day, setting up another warm night. The moisture will help drive rain showers on Saturday. 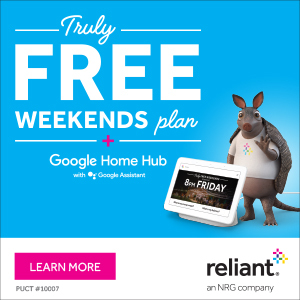 We can finally begin to have some confidence in the forecast for the weekend now. 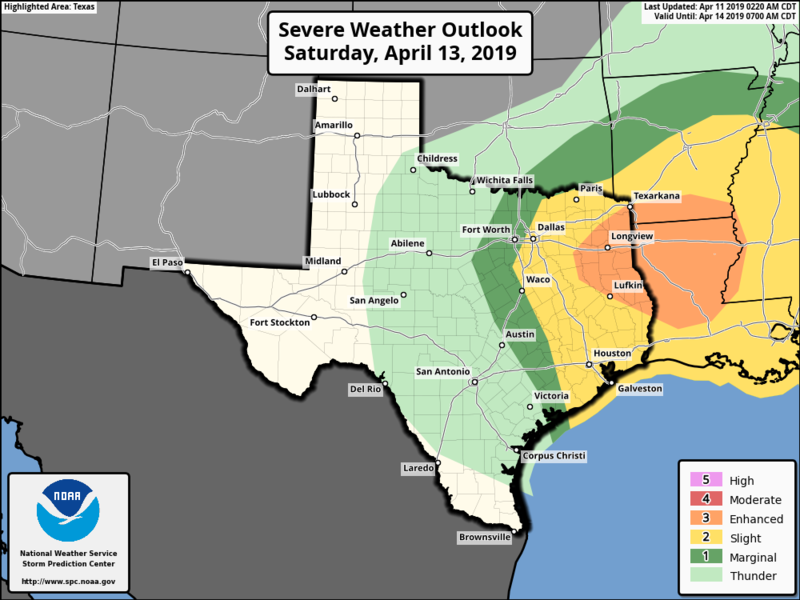 Most of the model guidance suggests the storm track on Saturday will remain north of the Houston metro area, taking the best chances of severe weather and heavy rain with it. As a result, the city will probably see healthy rain chances during the morning and afternoon hours on Saturday, with accumulations of perhaps 0.25 to 1.0 inch. At this time some severe storms are definitely still possible—check the radar before heading out on Saturday—but the greater concerns are for areas north of us. In terms of timing, rains probably will come to an end during the afternoon or early evening hours. This day looks exceptional in the wake of the front, with a high of around 70 degrees, sunny skies, and dry air. Sunday night’s low should get down into the 50s for most of the area. We should see a warming trend from Monday through Wednesday, perhaps getting back into the low- to mid-80s, before another front brings some cooler air and another healthy chance of rain. Thoughts on Galveston for Saturday ? Planning to take 35 people from church. Right now, rains appear less the closer one gets to the coast. I think there’s a decent chance you see a partly to mostly cloudy day, with only very light rain. Highs in the 70s, likely. Can’t rule out storms at this point, tho. Also speaking as an islander, most rain that attempts to blow through dies before it hits the island. You’ll see it coming, it will hit the bay, and then it dies. We usually dodge it. However, like Eric said it will most likely be cloudy. Now if we can only apply the “you see it coming….then it dies” to hurricanes. Not looking good for the Highland Games event Saturday. Shame its the first one the Houston Highland Games Association has done in almost a decade. How does the weather look for the Art Car Parade? Yeah, like the folks above me, I’m curious as to whether we should cancel a Saturday morning event involving farm animals, inflatables and rides. 😳 We’re NE Houston and just in a waiting pattern at this point. What’s the prognosis for Blue Bell race in Brenham Saturday morning? We are in Spring/Tomball area so definitely north of Houston but are we far enough north to be in the area you predict will receive the heaviest rain? Hosting a fundraiser Saturday night with a portion of it being outside so praying we don’t have to change plans. We’re planning a regatta for Saturday, what do the winds look like? Wunderground has really toned down the rain forecast for Saturday, now only 0.10″ sosuth of town. Not so much concerned about rain as we are the wind on the bay and if the sail boats can get out of the harbor…. how much white capping… etc…. anything more than 10 knots could be problematic for sailors. Raining on the Ship Channel now. What can we expect in the way of rain on I-10 during this time. Thank you. Accuweather is now saying rain on Sunday. Any thoughts?